Alright, so right after I said I was skeptical about neon in this post, I knew some neon-coloured item would come along and catch my eye and make me eat my words. (This is exactly what happened to me with skinny jeans; click here and here for the full scoop.) 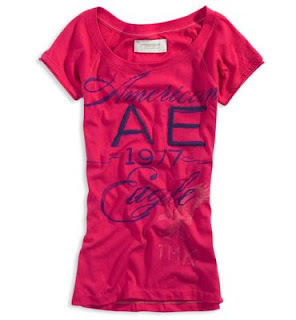 Anyway, last Saturday I made a rare sojourn to American Eagle Outfitters and saw this hot pink tee and fell in love. You know what? I'm wearing the shirt right now, and in it, I feel as hot as the hue. The shirt is extra cool due to the history now linked to it. miranym - It's definitely a refreshing colour at the moment! So bright and vibrant. Nancella - Haha you know the story behind the shirt too well! As for the skinny jeans, I don't wear them too often but that's only because I hemmed them a bit on the long side to wear with heels and I don't wear heels that often. I don't remember bashing skinny jeans recently, but I've always thought skinny jeans that are really clingy aren't that flattering on anyone. I like mine because they're slim cut but not superclingy around the calves and ankles.